Working in the music industry can often lead to us all thinking that we’re scholars and laureates of art and that everything we do, say and write can’t be argued against given the artistic value of it all. 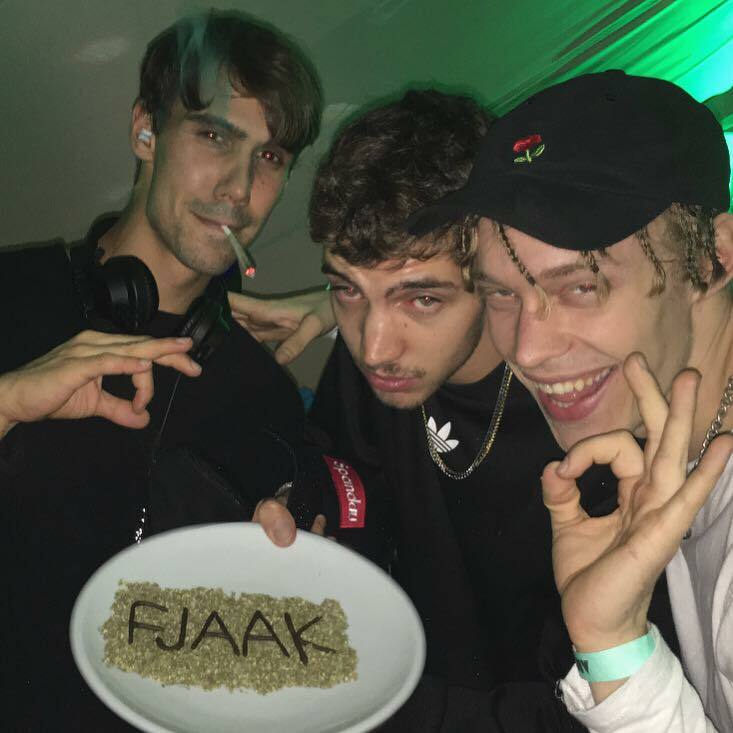 It’s at times like that, when we get caught up in our own pretentiousness that we need a trio like Kevin, Felix and Aaron to take us down a notch or two and basically tell us to get FJAAK-ed (I had to). That moment of realisation hit me harder than any of their kickdrums ever will the minute Felix answered our fateful Facetime call while on a train alongside his two partners in crime. The trio were heading from Berlin to a place near Munich, presumably for music purposes, and much like a group of overtired and giddy students coming home from a school trip, a phone call from an overeager journalist was most definitely the catalyst for the lot to perk up and show their colourful sides, even if it meant that questions surrounding their use of Detroit samples to make a unique blend of house-y techno fell by the wayside. Our conversation was supposed to kick off along those lines, but instead I was treated to the lovely views of rural Germany thanks to Felix who gleefully held his phone to the window. The uninspiring, predominantly grey, views of Dublin’s quays acted as my backdrop throughout and loomed increasingly larger as the minutes drew by. After I’d taken in the countryside, remixing Robert Hood still wasn’t the topic of discussion, instead we got to Aaron’s Russian bread that was filling his mouth so much he couldn’t utter a word regarding their blend of vintage sounds with their cutting edge productions. Finally, we settled down into a semi-normal state of conversation as Felix placed the phone where the luggage is supposed to be. His face, now upside down, wore a childlike grin. The FJAAK exposé I was hoping on achieving now had about as much chance of surfacing as one of the trolleys or safety cones did in the Liffey behind me. The red icon of the the upside down phone now seemed to be as prevalent as Felix’s upside down smile as the end of the interview seemed like another dodged question away. Thankfully, this wasn’t Tyler, the Creator circa 2012 that I was on the phone to, and the boys managed to spare my blushes with a few measured answers. “It feels like an always ongoing trip with your friends. It can be very stressful. Right now, we’re being pretty productive; Aaron’s eating, Kevin is working on the album and I’m answering some questions so that’s a pretty busy time.” Felix tells me, angling the camera towards the constantly chewing Aaron opposite him and Kevin who seems to be in a different realm while focusing intently on his laptop and what’s in front of him. While (sometimes) answering each question, the young techno producer continues to flick the camera sporadically towards the window, “Germany has a beautiful nature and a lot of good views. I feel so sorry for you man every time I change the camera the good views are gone!”. Just like that the signal breaks up and I’m left once again staring out at the mauve hue of the river Liffey. The phone perks back up and I’m greeted once again by Felix’s chirpish face, this time as if he’s just seen a premonition of Jesus in the thirty seconds we were disconnected: “You can’t imagine what I just saw! It looked like a YouTube video!”. While the references to the German countryside continue throughout our conversation, Felix’s attention focuses a little bit more on what’s being asked rather than the greenery all around him (outside the train that is). “Our record is coming out and we’re going to meet up with all of our friends and smoke weed. We want to reach highness on another level! Reach the definition of the word high”. Their new single drops today, the third on their new, self-titled white label series and features a much heavier blend of house influences alongside their own rather straight laced approach to techno. Of course, the original idea of the interview floated about due to their new record, but the group’s inherent and rather public love affair with weed is really what spurred us on to get in touch with them on what is basically the equivalent of St. Patrick’s Day to any Marijuana lovers out there. I’m back on the phone to Felix now, quizzing him about the importance of their new album. Just as we’re getting into the follow up to their first, self-titled album, Aaron sits back and yells uncontrollably as soon as the album word is mentioned. From then on in, it was back to being in the room with techno’s answer to Odd Future; admirable for their lack of self-consciousness but infuriating when it came to asking the somewhat important questions. With all three now wagging their tongues intimidatingly at the camera, it’s time to cut the cord and hit the red button that’s been screaming to be pushed since about 2 minutes in, my time with FJAAK is up luckily or unluckily, thankfully they’ve gifted us with two more morsels of techno excellence to wind down(?) to after such a frantic call.